For my project, I used Bella with Flowers. The images are perfect for simple watercoloring. I had lots of fun coloring these images. To prevent from the ink-bleeding, I applied clear embossing powder stamping stamping it in Versamark. Works like a charm--every single time. I colored the images with my favorite Zig Kuretake Gansai Tambi (36) Watercolors. I also added some stitched detailed by using Lawn Fawn's Stitched Borders. This set comes with 4 stitched lines that you can use individually or like I do here--4 at a time. It's a lovely addition with any stamped design. Such a sweet card, I love the pretty colours and the stitching details. Saw your card on SSS blog. It is just the sweetest card, love it! Very cute card .beautiful coloring! Sweet card, your water coloring is wonderful, I especially love the 'rouge' on the elephant. Aww this sure is cute! LOVE your coloring too! 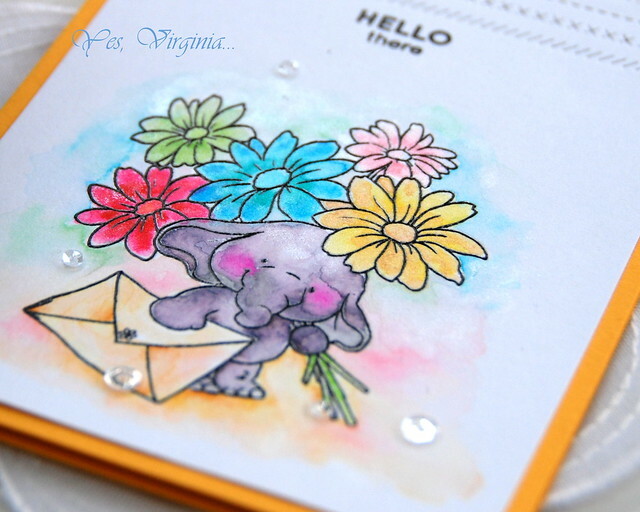 Sweet, sweet design, Virginia - and your watercoloring really has brought this image to life! Adorable ellie, Virginia, and I love all the stitch lines at the top!! Oh I LOVE that image!! Elephants are my favorite!! You did a great job coloring that little guy in and I adore the stitching at the top!! Well if this isn't cute, I don't know what is!! Super sweet Virginia! Awwww ... that is SO cute, Virginia! Saw this yesterday and commented all over the place. Thought I do so here, as well. 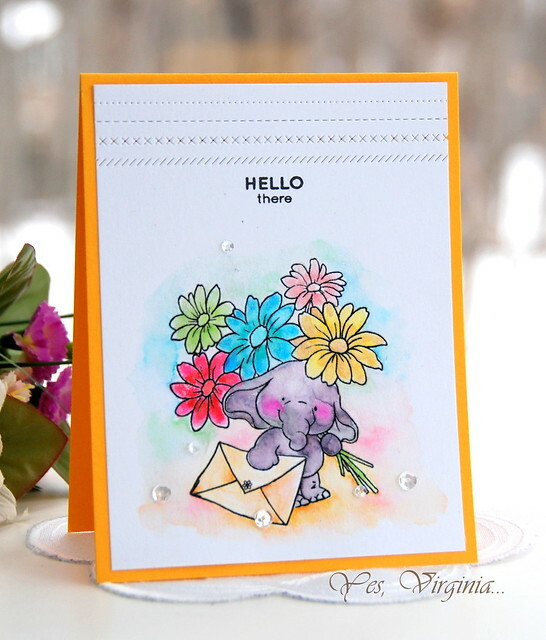 That elephant looks absolutely charming surrounded by those beautifully colored flowers. Charming card. This is absolutely precious Virginia and your wc is perfect! Awwww, what an adorable card, Virginia!! I love that image. And your beautiful watercoloring. I always forget to do that with the color around the images, but it looks amazing!! Such a cute image! I love the stitching lines at the top too!